DVD region codes are part of the DRM scheme. 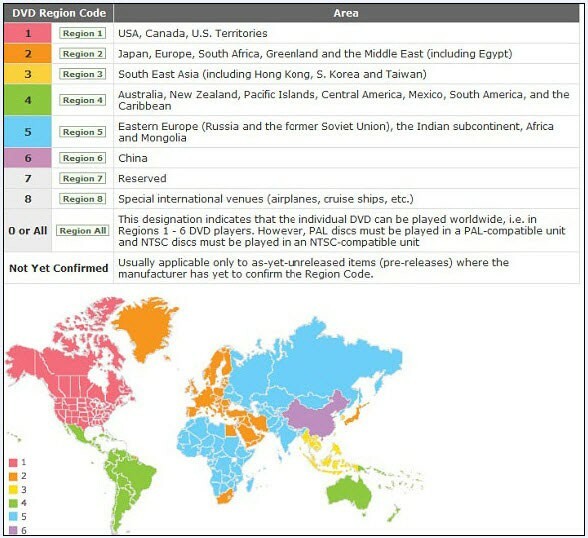 With the DVD region code, one can play a DVD disc in only a certain geographical regions. The commercial DVD player specification requires that a player to be sold in a given place cannot play discs encoded for a different region (region 0 discs are not restricted). The purpose of this is to allow motion picture studios to control aspects of a release, including content, release date, and, especially, price, according to the region. For example, if you buy a commercial DVD movie in America and want to play it on a DVD player bought in China, you will get failed. Many people are bothered by this. Then how to get rid of the annoying DVD region code? This article is divided into two parts, showing you the DVD region and two effective ways to remove DVD region code. If you want to get rid of the DVD region codes so that you can play DVD anywhere, just read on. If you just want to play different region DVDs on your computer, please refer to Change DVD region on Mac and PC for free. The DVD world is divided into 8 geographical regions, with 6 main DVD regions and two reserved for specialized use. You can see the map below to see what DVD region your commercial DVD movie disc and DVD player belong to. To remove DVD region code, you can back up your region code protected DVD disc to a blank DVD disc bypassing the DVD region code. To accomplish this task, you can use Aimersoft DVD Copy. It will help you copy and backup commercial DVD movies to DVD disc in 1:1 ratio. You can also save the DVD movie to your hard drive as DVD Folder or ISO image file. After the backup, you can play the DVD on any DVD player. In this way, you have removed DVD region code from the commercial DVD discs. Quickly and easily remove DVD CSS, RC and RCE protection. Copy DVD movies with 1:1 quality. Compress D9 to D5 or split D9 to 2 D5. Another way to make the DVD region free is to rip the DVD region protected DVDs to popular video formats so that you can play them on any media players, including iPhone 4S, iPad, iPod, etc. To rip encrypted DVD, you can use Aimersoft DVD ripper. It can help your crack the region code and CSS protection and convert DVD to popular video and audio formats, such as AVI, MP4, WMV, FLV, MKV, MOV, MP3, OGG, FLAC, WAV, etc. In this way, you can play your favorite DVD movies anywhere you like. Besides, this DVD ripper comes with a built-in video editor, which enables you to crop, rotate, trim videos, etc. The equivalent Mac version is Aimersoft movie ripper for Mac. By converting DVD to popular videos, you have got rid of the DVD region code. Insert your DVD disc into your DVD-Rom (Ensure that you have sufficient space on hard drive to store the DVD). Here you may worry about your DVD drive can't read the DVD Disc because of the incompatibility of region code. Yeah, normally, DVD drive in region 1 can't read and play DVDs that purchased from the UK(region 2)or other areas. But with this DVD Ripper, anything will become simple, it will automatically bypass the DVD Drive, you can play DVD with DVD Player software on your computer without restriction. This DVD Ripper also can backup DVD Movie on computer in VOB files with 1:1 lossless quality in clicks: 1. Click 'Load DVD' button to add the DVD file. You can also click 'Load File' to add DVD/IFO from your hard disk. 2. From the format list to select 'Lossless DVD Copy (*.vob)' to copy DVD to computer in 1:1 lossless quality. 3. Click 'Start' button to began. After you copy DVD Movie to computer, you can also use DVD burner software like Nero to burn VOB files to DVD to play it on other DVD Players. The DVD Ripper can rip DVD to almost all video and audio formats, such as convert DVD to AVI, rip DVD to MPEG, WMV, MP4, H.264/AVC, RM, FLV, MOV, M4V, XviD, 3GP, ASF, MP3, WMA, WAV, RA, M4A, AAC, AC3, OGG, etc. so you can play DVD Movie on iPad, iPod, iPhone, Zune, PSP, Apple TV, Xbox, Archos, Creative Zen, etc.